Bottom ejection is left and right hand compatible. Felt recoil is extremely low without a compensator — which makes me really wonder about the concussive muzzle brake installed on this demo gun. Great trigger, reversible charging handle, excellent accuracy. 1-6x scope is a good fit for the cartridge. It’s a pre-production gun, so I am still waiting for minor refinements of the safety lever, magazine release and sling attachments. But it’s nice to see very functional test guns out at public events, in this case the Bullpup Conference at Rockcastle Shooting Center. 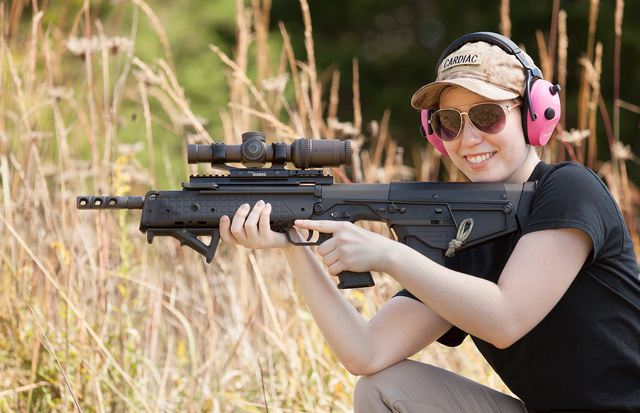 This entry was posted in pink, rifle and tagged 223, bullpup, optic. Bookmark the permalink. I’m waiting on its M-43 “wood & steel” brother. I just wonder how badly they heat up with your face resting on the action?